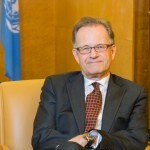 Michael Møller is the Director-General of the United Nations Office at Geneva. Mr. Møller has over 35 years of experience as an international civil servant in the United Nations. He began his career in 1979 with the Office of the United Nations High Commissioner for Refugees and worked with UNHCR in different capacities in New York, Iran, Mexico, Haiti and Geneva. Between 1997 and 2001 he was the Head of the Office of the Under-Secretary-General for Political Affairs at United Nations headquarters; between 2001 and 2006 he was the Director for Political, Peacekeeping and Humanitarian Affairs in the Office of the Secretary-General, while serving concurrently as Deputy Chief of Staff for the last two years of that period. Mr. Møller also served as the Secretary-General’s Special Representative for Cyprus from 2006 to 2008 and was the Executive Director of the Kofi Annan Foundation from 2008 to 2011. The Dean for Religious Life at Stanford University, Reverend Scotty McLennan has previously served as the University Chaplain at Tufts, visiting professor at the Fletcher School of Law and Diplomacy, and senior lecturer at the Harvard Business School. An ordained Minister in the Unitarian Universalist Church, Reverend McLennan holds M. Div and J.D. degrees from Harvard”s Divinity and Law schools respectively. He has practiced in the Boston area as a church-sponsored poverty lawyer. The author and co-author of two books on topics of business, ethics, and religion – Finding your Religion: When the Faith You Grew Up With Has Lost Its Meaning and Church on Sunday, Work on Monday: The Challenge of Fusing Christian Values with Business Life – Reverend McLennan brings a uniquely diverse set of experiences to the IBJ Advisory Board. Tony Saich is the director of the Ash Institute for Democratic Governance and Innovation at the Harvard Kennedy School and the Daewoo Professor of International Affairs and Director of the Harvard University Asia Center. He is Faculty Chair of the Asia Programs and the China Public Policy Program at the Kennedy School of Government, Harvard University. This work includes significant training programs for national and local officials from China, including a program to help Beijing officials prepare for the Olympics. He also sits on the Executive Committees of the Fairbank Center and the University”s Asia Center. From 1994 until July 1999, he was the Representative for the China Office of the Ford Foundation. Prior to this he was the director of the Sinological Institute, Leiden University, the Netherlands. He first visited China as a student in 1976-77 and has been there for longer or shorter trips almost each year since. Currently, he is also a guest Professor at the School of Public Policy and Management at Tsinghua University, China. He has advised a wide range of government, private and not-for-profit organizations on work in China and elsewhere in Asia. He is a member of the Trustees of the China Medical Board of New York. His current research focuses on the interplay between state and society in China and the respective roles they play in the provision of public goods and services at the local level. He has written several books on developments in China, including: China”s Science Policy in the 80s (1989); Revolutionary Discourse in Mao”s China (1994, with David E. Apter); The Rise to Power of the Chinese Communist Party (1996); The Governance and Politics of China (2004). He has just finished editing a book on reform of China”s financial sector and on HIV/AIDS in China. He studied political science in the U.K. and has taught at universities in England, Holland, and the U.S.
Hilde Schwab helped her husband Klaus Schwab in organizing the very first World Economic Forum in Davos, Switzerland in 1971, a platform for business leader discussions based on the multistakeholder principle he published the same year.At her suggestion, environmental and social activists were given a voice at the Annual Meetings helping to promote the causes of many, including anthropologist Margaret Mead, liberation theologist Archbishop Dom Helder Camara, environmentalist Carl Sagan and Swiss animal welfare advocate Franz Weber.Having a passion for contemporary art, and believing that culture is the language that inspires and allows people to better understand one another in a diverse world, Hilde invited famous artists to participate or exhibit their works at the World Economic Forum meetings. Together with Yehudi Menuhin, she created the Crystal Award in 1996 to honor each year outstanding leaders in arts and culture. She was the project manager for the new World Economic Forum building, completed in 1998, ensuring that the values of the Forum such as openness and transparency were incorporated in its construction. Hilde felt that grassroots social entrepreneurs, who have innovative ideas to address social and ecological challenges such as education, health and poverty, should also interact with corporate and political leaders. So, in 1998, she and her husband Klaus created the Schwab Foundation for Social Entrepreneurship. The Foundation now comprises a community of more than 160 outstanding social entrepreneurs worldwide who contribute to all the activities of the World Economic Forum. She serves on the board of Global Dignity, which promotes the right of every human being to lead a dignified life. Cornel West is the preeminent African-American intellectual of our generation (Henry Louis Gates, Jr.). Now a professor at Princeton University, he is the former Alphonse Fletcher Jr. and University Professor at Harvard University, teaching in Afro-American Studies and Philosophy of Religion. His most recent publication is The Cornel West Reader (2000). Among his numerous other published works are the two-volume Beyond Eurocentrism and Multiculturalism (Common Courage Press, 1993), Breaking Bread (South End Press, 1991), Race Matters (Beacon Press, 1993), Keeping Faith (Routledge, 1993), Jews and Blacks Let the Healing Begin (Putnam Books, 1995), co-authored with Michael Lerner, and Restoring Hope: Conversations on the Future of Black America (Beacon Press, October 1997). Professor West is a well-respected and extremely popular lecturer. His speaking style, forged in the Baptist Church, provides a blend of drama, knowledge, and inspiration. Elbegdorj Tsakhia is a public servant, a freedom fighter, and a policymaker from Mongolia. In 1990, he was one of the key leaders of the Mongolian Democratic Revolution and since then have continuously served Mongolia as a Member of Parliament four times, Prime Minister two times, and was elected President for two terms. Born in the isolated Western Mongolia as the youngest of eight sons from a humble traditional nomadic beginning he has worked as a machinist in a copper mine, a soldier and a journalist in the army newspaper. Currently, Mr. Elbegdorj is continuing his work to improve public policy, governance, and democracy through the Elbegdorj Institute, a think tank he found in 2008. During his tenure as President, he also focused on the impacts of climate change, air and soil pollution, the most significant public health issues in the capital of Mongolia. Through his Green Belt Foundation, he continues this work as well by bringing together multi-stakeholders to find novel solutions to these challenges. He also supports Mongolian studies and aims to achieve the United Nations Sustainable Development Goals in Mongolia successfully. Mr. Elbegdorj is now Commissioner of International Commission against the Death Penalty (ICDP), Patron of the World Sustainable Development Forum (WSDF) and Member of World Leadership Alliance – Club de Madrid. 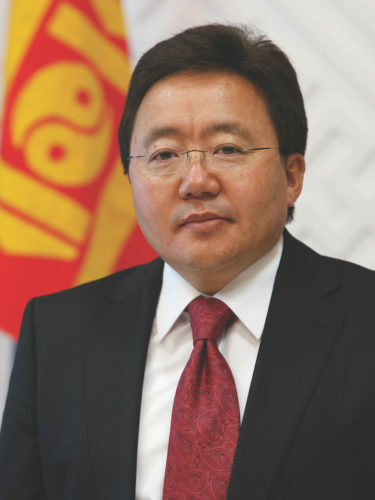 Mr. Elbegdorj holds Master of Public Administration from Harvard University John F. Kennedy School of Government (2002) and Bachelor’s Degree in Journalism from Land Forces Military Academy of Lviv of former USSR (1988).